A confirmation e-mail will be sent after the reservation is received. 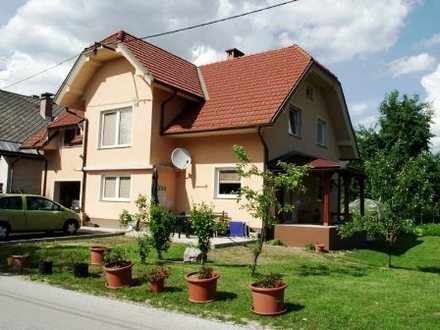 In the quiet village Bodešče near Bled is situated family house, in which we rent 85 squares big apartment. Apartment Valant Bled is situated on two floors. On the first floor is a kitchen, a living room and sofa bed, bedroom with double bed, hall and bathroom with shower and toilet. Upstairs is an air-conditioned bedroom with 4 beds, it is possible to have extra bed. The Apartment Valant Bled is fully equipped (cable TV, wireless internet, fridge, freezer, washing machine, iron, hair dryer) and is suitable for stays of up to 7 people (6 +1 beds). There is also a large garden with deckchairs, children can have fun on a trampoline. Await you with a welcome package also we say goodbye with a small attention. Parking is guaranteed.